I have an excellent, must-have, can’t miss FREEBIE! for you Dreadites today. It’s the perfect tale for heavy metal zombie heads in varying stages of decomposition, Gregory Lamberson’s Johnny Gruesome. 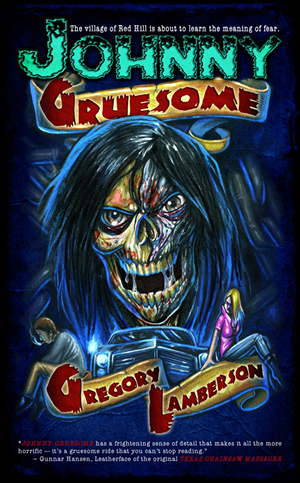 We have quite a bit of virtual space reserved for Lamberson here at Dreadful Tales and I think the majority of his work has been reviewed here, including Johnny Gruesome a couple years back which you can read in full here. But the reason I’m resurrecting this “headbanger from hell” today is, as I mentioned above, the eBook version for both Kindle and Nook is available for a limited time for FREE! FREE! FREE! Sorry, I don’t mean to “yell,” but this is worth getting excited for. Johnny Gruesome is a leather jacket wearing bad boy from the wrong side of the tracks, returned from the dead to give his enemies the what for in often creative and always nasty ways. 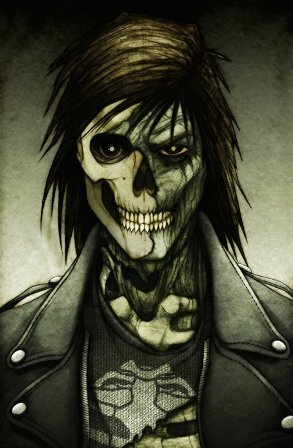 This is the ghoul I envisioned when I heard the old 60’s cut “My Boyfriend’s Back” by The Angels. The biggest difference is there is some kinda sweetness to “My Boyfriend’s Back.” He’s coming back to save his lady from what we can only assume is a stalker. Did I interpret that wrong? Anyway, there is no sweetheart tale in Johnny Gruesome, as much as I love a romantic story; this is a rebel yell revenge tale. I go into quite a bit of detail regarding the basic plot (sans spoilers) and characters in my review (again, you can check that out here), so I won’t rehash all the gory specifics again, but here a couple highlights of note: Johnny Gruesome is a back-from-the-dead revenge slasher story as opposed to the survivors vs. zombies ilk. Lamberson puts his filmmaking skills to work with his cinematic prose so the imagery comes easily keeping the pacing steady. Johnny Gruesome reads more like a comic book than a novel, without the pictures of course. There are some excellent illustrations by Zach McCain included in the hardcover edition from Bad Moon Books which you can try to track down here, but it will be for a pretty penny. I have my own copy and think it’s worth every cent, but if that’s not in your budget, you can pick up the free version. Just follow the links below and hurry because it’ll only be free for a limited time! Kindle users can pick up their free copy here. Nook users go here for your free copy. Check out the trailer for Johnny Gruesome here. And for more about the author visit his website at slimeguy.com. This entry was posted in All Hallow's Read, Bloody Bytes, Novels and tagged all hallow's read, freebie, Gregory Lamberson, Johnny Gruesome by Meli Yoroshiku. Bookmark the permalink. I love your blog. This book looks good. I read and review horror novels also its nice to see a blog thats giving me titles to add to my reading list. Thanks for the kind words, David. I’ll have to check out your site. You should stop by The Mortuary forums as well (www.the-mortuary.com) where readers meet to discuss our Book of the Month. There’s plenty to discuss on this forum, but the readers often hang out in The Psychopedia Necronomicon thread. Will do. Its nice to meet someone that is in to horror nvels like I am. I don’t like horror movies as much as I use to but I still love to read horror novels. I didn’t start reading horror literature until several years ago. Before that I was just into horror movies. Now I like both, but I typically read more horror than I see horror movies.